A chance encounter with this blog allowed us to solve a problem for The Loyola Institute at Trinity College Dublin. It’s a common enough scenario in large organisations. A department or team page is part of a larger institutional website and is just not getting the traffic. The reasons can be that the site itself is old, non-responsive, is run by an antiquated content management system – one that creates multiple pages and adds unnecessary depth to the site. Before you know it, your page is 5, 6 or 7 levels down from the home page: a place where you’re just not going to rank. “I knew we needed help with social media and online marketing, but I didn’t really know what to ask for. Meeting Brightspark was amazing. From the moment I first picked up the phone, they quickly grasped exactly what I needed and made a brilliant series of suggestions …. a quiz, a website with really clear information, a harvest of email addresses for follow up. This is the story of how we created TrinityTheology.Rocks in late 2015. The objective is so clear: to increase the number of CAO applications for Catholic Theological Studies at Trinity. CAO closing date is at the end of January. We didn’t have a lot of time, but that’s OK, we get off on that kind of thing here at Brightspark! The target audience is also really clearly defined: sixth year students considering their college applications. The client is a delight and pleasure to work with: clear thinker, appreciative, and responds quickly. That they could get their heads round the ins-and-out of both Theology and a big complicated institution (Trinity) inside of a fortnight, and make it all look manageable … and even fun! … is deeply impressive! Professor Garrigan knew she wanted to be on Facebook – we suggested including Instagram and Google into the mix – so we needed to create a piece of content or a destination that the target audience would find interesting. Quizzes rock as any Buzzfeed reader will tell you. And we didn’t want to go in with a hard sell for this uber sophisticated social media audience. 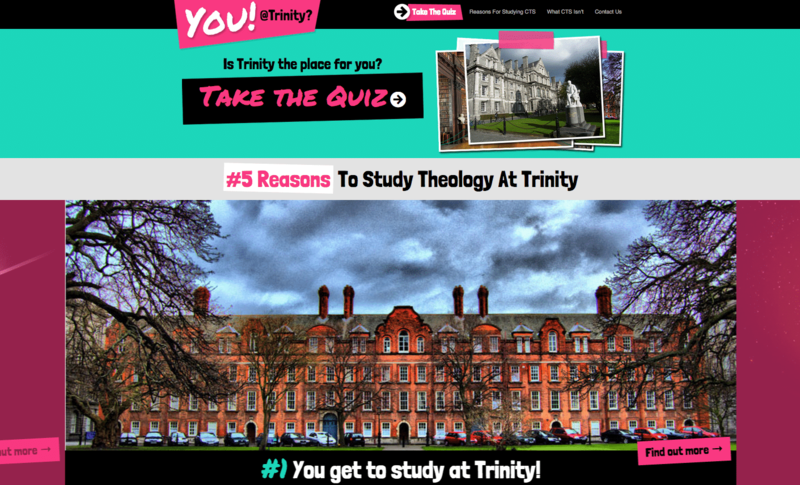 So we decided to design a quiz for students to find out if Trinity is the right place for them. And to build a microsite to house it. We had fun with names, and colour, language style – and we all learned a huge amount about what a Catholic Theological Studies degree at Trinity is about. We also felt it important to create a page on what CTS isn’t. Note: if you know someone who is unsure as to what to study, and they love history, philosophy, psychology, and languages, then this might be the degree course for them. The Catholic Theological Studies course is new to Trinity, so it’s got cool things built in like placements in charities and human rights organisations as part of the course, and lectures that take place in galleries and use film not just books, to convey knowledge. 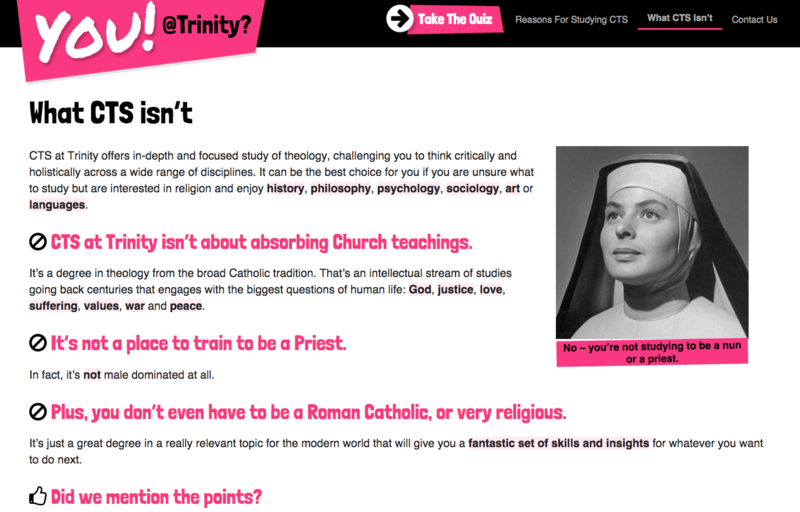 The central content on the site is “5 Reasons To Study CTS At Trinity”. These can be accessed by people who flick through the carousel on the home page, or by browsers who would like a little bit more detail on the inside pages. 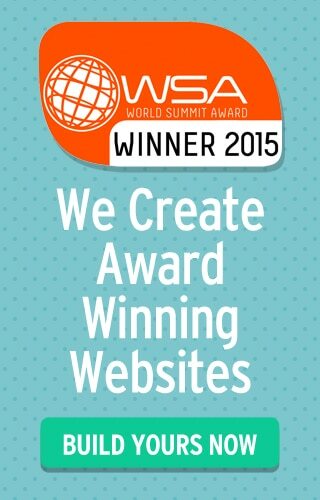 The most stressful part of the project was dealing with the flaky WP quiz plugin that we chose. (I don’t want to diss the plugin publicly because the plugin developer did try to help, but if anyone wants to know what plugin NOT to use for Quizzes, contact me directly). We invested a lot of time building out the content and uploading images, only to find that the plugin only worked with the newest version of php on the server. This sparked calls to Blacknight who, incidentally, are not running the newest version of PHP, as well as a frustrated rebuild of the site as we moved it from one server to another. Much praise is due to Heidi Jermyn, our long time collaborator who pulled out all the stops to create this really cool website! In the end, the quiz is cool. The images are quirky and they work to communicate the right message (thanks Aimee). We built a website and quiz in two weeks using WordPress. The content is really strong and the design is fun, eye-catching and spot on for the target audience of 16-18 year olds. Midway through the design process, we were pleased to see a piece on e-Consultancy blog about eye-popping design trends of 2016 and featuring a design that was more or less what we were working on! There have been 537 completed quizzes in the weeks running up to CAO closing date! 1,811 unique visits, not surprisingly they are almost all mobile users! Now to turn our attention to the marketing – read on… if you want to find out about how we are using Instagram, Facebook and Google, with a little marketing automation to capture the hearts and minds of sixth year students. Brightspark was able to grasp exactly what was needed and made a brilliant series of suggestions. That they could get their heads round the ins-and-out of Theology and a big complicated institution (Trinity) inside of a fortnight, and make it all look manageable - and even fun! - is deeply impressive. I am confident that Brightspark's work will really help us accomplish our mission.